The US Geological Survey (USGS) National Cooperative Geologic Mapping Program (NCGMP) in partnership with The Geological Society of America (GSA), GSA Foundation, Association of American State Geologists (AASG), American Geosciences Institute (AGI), American Institute of Professional Geologists (AIPG), and the Journal of Maps invites students to participate in the Best Student Geologic Map Competition. This year marks the third annual Best Student Geologic Map Competition at the GSA Annual Meeting in Baltimore, Maryland. The competition will highlight student research from around the world that utilizes field mapping and the creation of geologic maps as a major component. The top three student geologic maps will be selected for recognition and awards at a special judging session at the GSA Annual Meeting. Students will post their maps (Session Posters) on Tuesday, 3 November by 5:00 PM until 6:30 PM in the Poster Session area of the Exhibit Hall for review and evaluation by the judges. Maps may be placed in this area as early as 9 AM Tuesday, 3 November, but must be removed at 6:30 PM following the session. At the end of the session the top three maps will be selected and awarded. Found this interesting startup which claims to have invented the “simplest way to communicate a location”. The startup, what3words, divides the world up into 57 trillion 3×3 meter squares and then assigns each with three words that makes them unique. With that, you now have a unique address for any location on the globe … even in the middle of nowhere! From a human standpoint this makes sense. We can remember three words for an address fairly easily, especially in a remote location that may not have an established address system. However, gridding the world is not new. We have many world grid systems, like MGRS that goes down to 1 meter squares. Will what3words catch on? Who knows. Maybe if Amazon starts using it for deliveries by drone! Start telling your friends to meet you at “humans.flash.crab” after work! I wanted to remind everyone to become a part of the CA GIS Council before our meeting next week at CalGIS (meeting details will follow tomorrow). From the membership we will set up nominations and voting for membership of the executive committee. We currently have 79 members of the council, which is a great start! Registering is easy – since the council is voluntary, it’s a simple process – register on the council website and you are a member!!! Fill out the information, and click “Register”. Make sure to select your constituency so that you can be included correctly. All along the Cascades and Sierra Nevada are ski courses that never opened, bare mountains and snowless SNOTEL sites where snowpack is measured. Where snow accumulated, it melted prematurely during a warm March. One of the most common questions for snow surveyors has been: how does this winter compare to the past? A new, interactive map shows you exactly how it compares. The online map, just released by the USDA’s Natural Resources Conservation Service, shows regularly updated current conditions, alongside historical records, for the entire NRCS snow survey network. Snowpack data in the new map is updated several times a day with edited information. Check it out! The North American Cartographic Information Society (NACIS) recognizes the important contributions students make to our field. To promote their hard work and achievements, we offer two fantastic student competitions each year at our annual conference (held this year on October 14–17 in Minneapolis, MN). All students currently enrolled in a certificate program, undergraduate, or graduate/post-graduate program are eligible to enter, as long as they have not previously won the top prize in either competition. NACIS recognizes the importance of dynamic mapping in cartography. We are sponsoring the 16th Annual Student Dynamic Map Competition to promote cartographic excellence and innovation in this versatile medium. Two prizes of $500 will be awarded; one for and individual project and one for a group project. Deadline for submissions is September 11th. To view the rules and prizes, please visit http://nacis.org/awards/student-dynamic-map-competition/. Students who would like to display their works at NACIS 2015 should register for the Student Map and Poster Competition. There are two competition categories: cartographic design and research quality. We encourage all students to submit their maps and technical/research posters for a chance at one of two $500 prizes! There is no entry fee. All entrants will be displayed in the Exhibits Gallery, and the winner will be selected by a ballot of all meeting attendees. The deadline to register is September 11th, 2015. For more information, please visit http://nacis.org/awards/student-map-and-poster-competition/. Please take a moment to encourage your students to enter either of the above competitions. We look forward to seeing the diverse range of entries in Minneapolis! As an organization (and as former students ourselves), we’re aware that student budgets don’t often allow for extras like conference attendance. Each year, NACIS offers a number of travel grants to students wishing to attend the annual conference. To find out more, please visit http://nacis.org/awards/grants/. Thank you, and we hope to see you in Minneapolis in October! 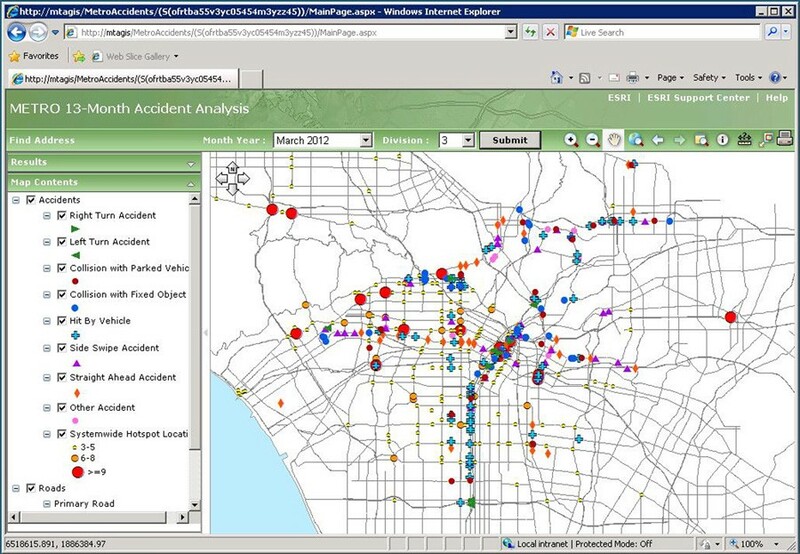 Check out this article about how LA County Metropolitan Transportation Authority is using GIS to automate bus safety. And … they also have a job opening right now!